The Choose Label macro provides the user with predefined options for adding labels and generated suggested labels to a page if they are not already present. We now allow the use of some predefined variables. Additionally through ScriptRunner for Confluence we also allow the user to overwrite these variables, or add user specified custom variables. Select the Choose Label macro from the provided list. Specify a title for the macro which will be displayed above the macro. Specify the labels using a comma separated list. Supplied variable labels are $username, $fullname, $year, $month, $day $parent (parent title of the current page). A comma separated list of descriptions that can be applied to labels. If left empty, the description of each label will be the same as the label. If populated the length of the description and label fields must match. Specify custom text for the add label button. Allow multiple labels to be added at the same time. Allow the system to suggest labels on the macro based on the content of the page. Shows the suggested labels on the label dialog. Without the "Multiselect" option selected, the macro will be hidden after the first label is added. With "Multiselect" enabled the macro will be hidden once all the labels are added, additionally several labels can be added at one time. Generated suggested labels are not taken into consideration when hiding the macro. 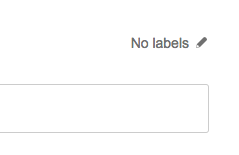 Label suggestions will only start working once at least 100 words are added to the page. Label suggestions become more accurate as more words are added, with good suggestions arising over 500 words. Supported languages are English, German, Dutch and Danish. 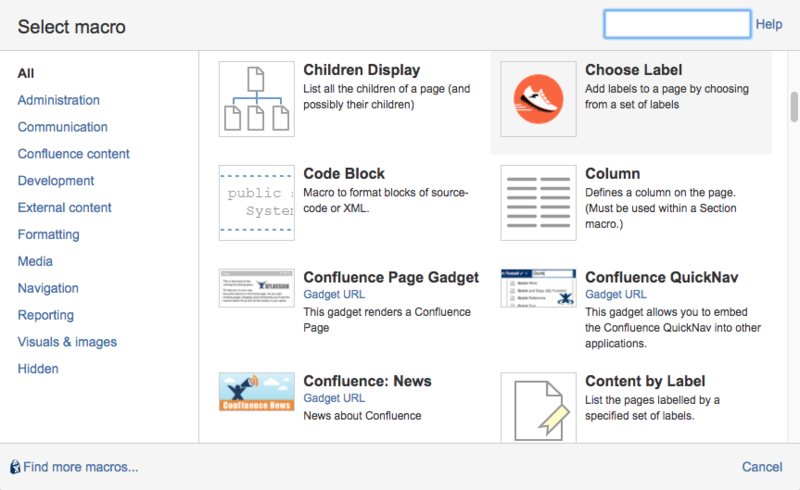 Mixing languages on a Confluence page results in undefined label suggestion behaviour. 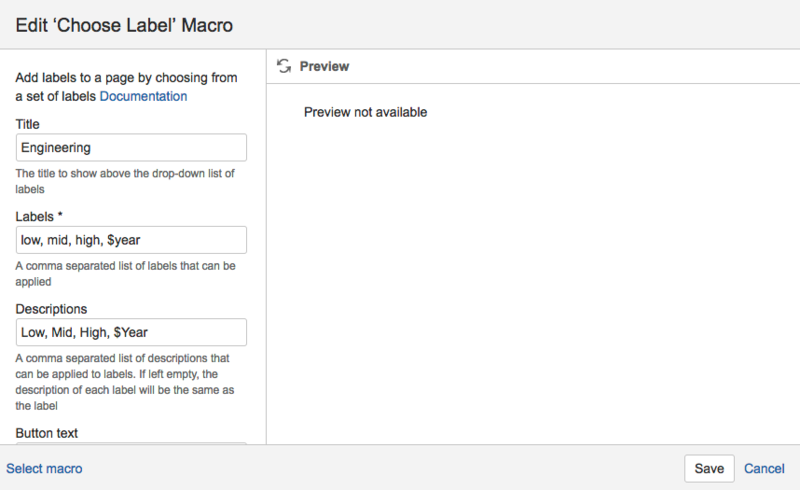 The next time the page where the macro is located is opened the choose label macro will be shown. Only the applicable labels will be shown. If all the "Provided labels" are already present on the page, the macro is not shown. Please see example 3 below for more information on the "Show suggested labels on the label dialog" option. To use the provided variables as labels simply add any supported variable as you would any normal label using the Choose Label macro. The rendered macro will then appear on the page. The $year variable resolves to 2016 and if chosen 2016 will be added as a label on the bottom right of the page. Multiple selections can be made. 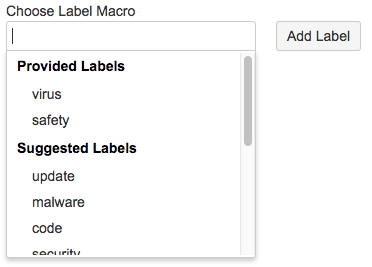 To use the generated label suggestions feature simply tick the "Show suggested labels on the macro" checkbox. 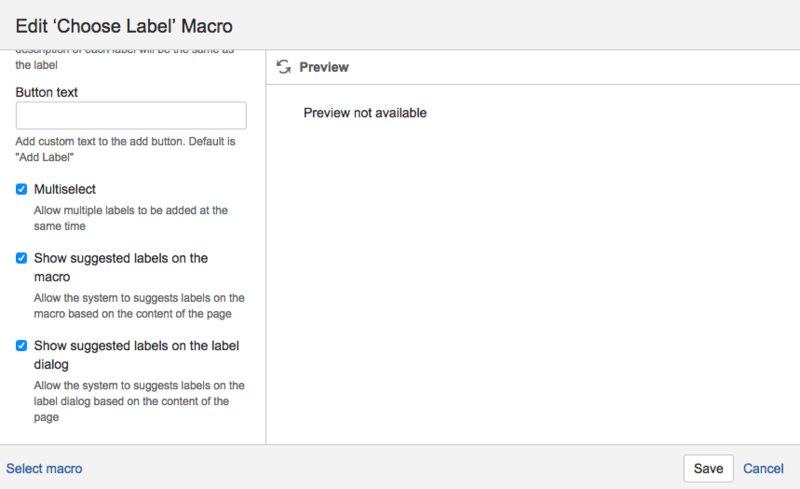 The macro will then make best effort label suggestions based on the page content. 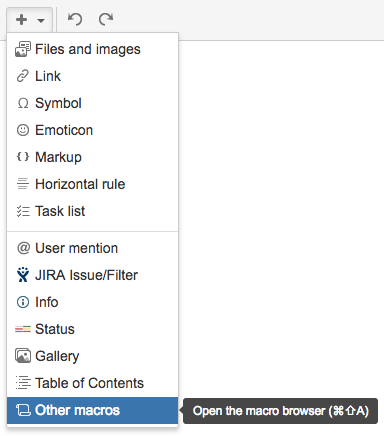 To suggest generated labels to the user on the Confluence label dialog, simply tick the "Show suggested labels on label dialog" checkbox. Open the Confluence label dialog by clicking the pencil icon on the bottom right of the page, or by pressing "l" on the keyboard. The suggested labels are located above the text input field and clickable. Clicking a suggested label will add it to the page, as can be seen below with the label named "bug"